Everyone agrees: grill marks = flavor. The brown crust that forms due to the exposure of meat to high heat (Maillard reaction) produces the most flavorful bites. So why are we happy with food that only has strips of flavor? What if we could have all-over flavor? We can! The Slow ‘N Sear and the Cold Grate Technique make it both possible and incredibly easy. …and HELLO! to all over sear and fantastic flavor! Why are we so used to grill marks? It’s no surprise that we’ve learned to think that a grill-marked steak looks delicious. 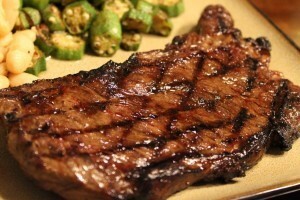 Most grills (even in restaurants) don’t get hot enough to deliver an all-over sear to the food. Instead, they rely on the heat from the cooking grate to do most of the cooking. The meat touching the grate gets nice and browned but the rest of the surface just gets cooked without any additional flavor. 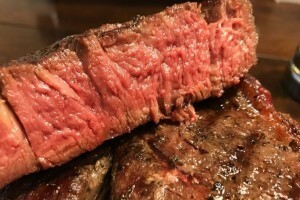 This is why you usually see tan banding around the outside edges of a grill-marked steak when you cut into it rather than the wall-to-wall color you get with the Cold Grate Technique. No tan banding here! This Cold Grate, reverse seared ribeye has wall-to-wall uniform interior color. The patented design of the Slow ‘N Sear perfectly solves this problem. Now that we have an intensely hot sear zone, we’re going to let the fire do the cooking and not the grate. Instead of heating up your cooking grate, do everything you can to keep it COLD and out of the way of your intense radiant heat. Use a thin wire grate so it can’t store heat energy and put it on at the last moment so it’s not hot when the steak is first set on the grill. Maintain a two zone fire so only part of the grate is over the sear zone. When it’s time to flip, spin the grate so that you’re always using a cold grate and a very hot fire to sear. Why so much effort? Why not just use a cast iron pan? You’ll notice that many articles about cooking a perfect steak inside use a cast iron pan. Cast iron delivers all the same benefits of all-over sear as does the Cold Grate Technique. But there’s a reason why so many of us cook with charcoal – the additional flavor added from the charcoal and/or smoke wood during the cook adds another layer of flavor that you just can’t get with cast iron. Can the Cold Grate Technique be used for either front or reverse sear? Yes! Since a reverse seared piece of meat is already cooked close to final temperature the total sear time will be less than using the technique for a front sear. They key to front or reverse searing is to flip often (every one minute or so) so the cooking grate doesn’t get hot enough to leave sear marks. Can you use the Cold Grate Technique on meats other than steak? Absolutely! In our recipe videos, we’ve shown the Cold Grate Technique on lamb, chicken, as well as various cuts of beef (ribeye, tri-tip, prime rib). 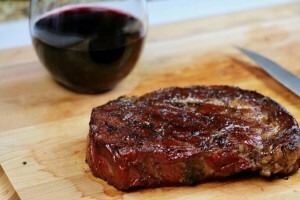 It’s a perfect way to add a finishing sear to any meat without risking lines of overcooked meat or skin. Don’t forget the addition of a small handful of wood chips on hot coals to infuse your steaks creates far more flavor than the malliard reaction. Disagree. Strongly. If this were true, then “baking” a gray steak at 250 in a smoker would produce a better steak than high-heat searing or grilling. Won’t get many to sign on for that. The Maillard reaction is at least 80% of a great steak, that’s why the classic pan sear makes such a great steak all by itself. Charcoal/wood smoke definitely improves on that in my opinion, but without the Maillard/seared crust you’ve got cafeteria meat. Using the cold grate method is not bypassing the Maillard reaction. How does the cold grate technique work with a reverse sear where you have been cooking on the grate? 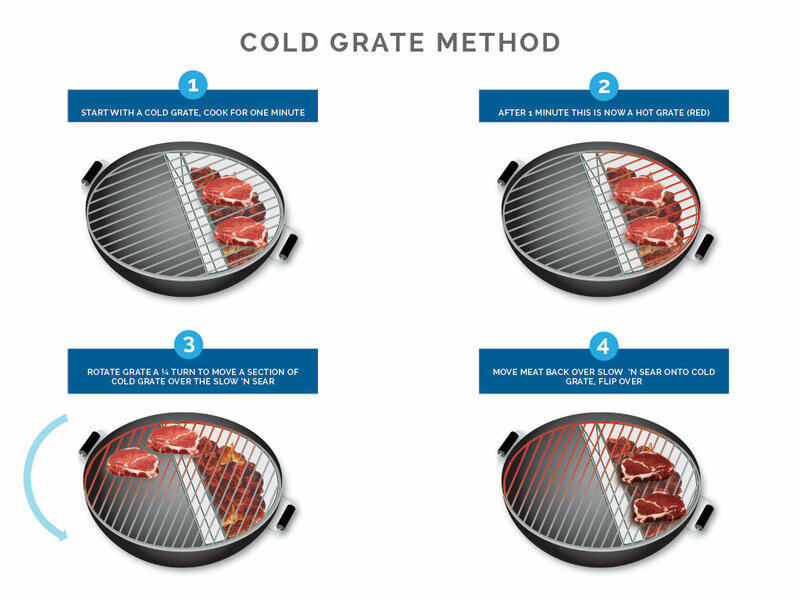 Do you use a second grate for the cold seat process or is the low cook zone side low enough temp to prevent the grill marks when reverse searing? Scott we take the grate off for a minute or two after the low and slow cooking is done and while the steak is being prepped for searing. When ready to sear just throw the grate on, give it a quick scrub to clear off any debris, then start searing, rotating and flipping! This looks great! I use reverse sear and I bought the custom grill grates that fit perfectly above my SnS. If I go with this cold grate approach, I assume I wouldn’t use the grill grates, since they would get heated and stay hot? That’s ok, I will definitely try this. Thanks! We sell online through this website and we have our two most popular Slow ‘N Sears for sale on Amazon. I just saw the video on cold grate technique with filet mignon. I just got done eating the filets. I used about 35 coals. The grill ran a lot hotter than 225 but it did not seem to matter. The slow n sear (along with the site by Meathead) is TRANSFORMING backyard cooking! The videos are really great, but as for remembering the recipes when you’re preparing the meat and working the grill ,,, you’re asking yourself, “Now, how did he do that?” How about printing up the procedures for download as pdfs? Great idea! We will add it to the to-do list! Thanks for the feedback! The cooking oil applied prior to the sear..is this usually just extra virgin olive oil? Wasn’t sure if one was preferred over another when considering taste or flashpoint. We typically use EVOO (extra virgin olive oil) for it’s subtle flavor. Ghee also works great. Personally I use veg oil. It is cheap and has a higher smoke point than EVOO (which burns on a hot cook like this anyway and leaves an acrid taste IMO).